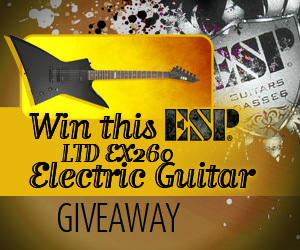 Win an ESP LTD EX260 Electric Guitar from TheLiveLine!! TheLiveLine and ESP Guitars have teamed up to giveaway an ESP LTD EX260 Electric Guitar to one lucky shredder. To enter, head over to TheLiveLine and click the “ESP contest” graphic in the top right corner: http://www.theliveline.com. And while you’re at TheLiveLine, check out some new artists we’ve brought aboard, even including a TV celebrity, call some numbers for free, and make sure to leave these artists some voice messages! Keep an open eye on us – we’re expanding fast! Featuring EMG-ESP LH300 humbuckers mounted in an agathis body. A rosewood fingerboard boasts 22 extra jumbo frets and dot inlays. Topped off by black hardward and a 3-way pickup selector switch.